I get a farm veggie box delivered to my house once a month. Sometimes it’s a magical mystery tour and I have no idea what something is or how to cook and eat it. This week we got this alien, fractal looking oddball. I did like the bright green color but of course had no idea what it was or what to do with it. Guess what it is? 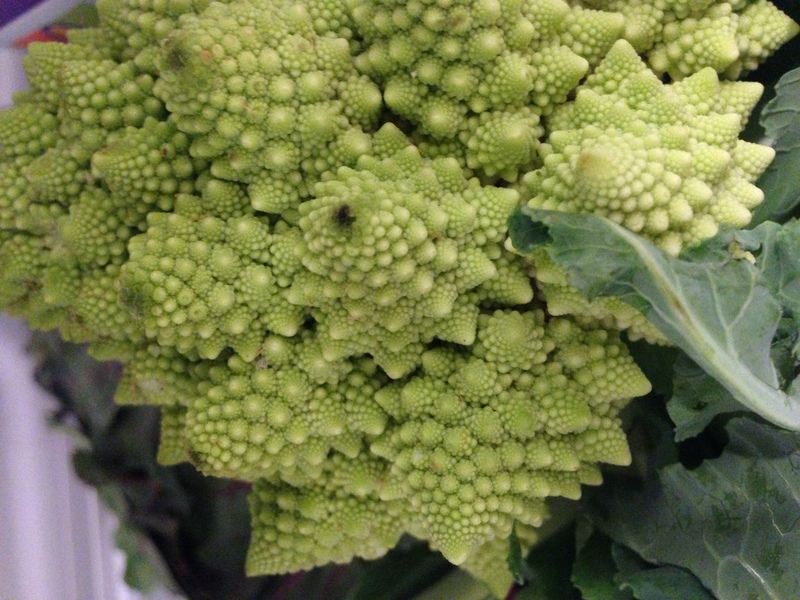 Romanesco, a part of the broccoli/cauliflower family and its description sounds pretty yummy. I decided to add it and swiss chard to pasta. I roasted it with a little olive oil than tossed it with the pasta. I would say it has a very mild flavor so if you want to introduce your kids to a fun looking vegetable than Romanesco is the way to go. Last year we grew lots of cauliflower and broccoli in the garden so I am guessing this would also grow well, I may need to add it to my list of what to grow next. I think we’ll finish off the evening with pumpkin muffins. We did spend the day cleaning the yard of dead leaves and trimming unruly plants. It was a sunny day and it was nice to be outside and now my yard looks fabulous!